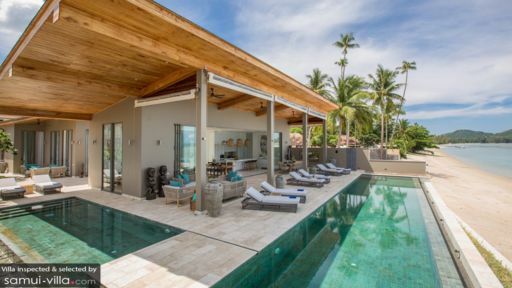 Villa Kirana is an absolute beach-front, 6-bedroom luxury villa found on the southern coastline of Ko Samui in Thailand. This beautiful tropical holiday getaway is just the perfect family retreat as great thought has been given to the little ones with a playing room and a shaded, shallow wading pool for them to have some water fun. Villa Kirana also enjoys 20 meter of beach frontage and a stunning infinity pool that looks out onto the ocean. With the combination of excellent service, breathtaking views and kid friendly facilities, villa Kirana is the perfect family luxury haven you have been looking for. The king-bedded master pavilion is located by the poolside and offers great views over the bay. This restful, air-conditioned villa suite wears calming natural colours and hand-crafted wooden furniture, creating a serene ambiance. There is a TV with DVD-player for entertainment and a grey terrazzo bathroom boasting a large bathtub to soak in and his and hers rain-showers. The en-suite bathroom opens up to a private garden where you can enjoy some quiet time. The other 5 bedrooms found within villa Kirana are all spacious and enriched by traditional artwork, ornamented furniture and a natural colour scheme. The rooms feature air-conditioning, indoor and outdoor relax corners, comfy double beds and private en-suites. One of the rooms is adjoined by the bunk-bedded kid's room that sleeps up to 4 children. The outdoor area of villa Kirana features an 18 metre edged infinity pool that stretches along side the shore of Laem Sor, providing you with magical views over the turquoise ocean while swimming laps in the pool or sunbathing on one of the poolside sunbeds. For the kids, there is a special wadding pool surrounded by a sun-deck for easy supervision. The secluded beach is not only a gorgeous view to take in, it also makes a great playground for the kids and the calm ocean is perfect for snorkeling or kayaking on another wonderful day in paradise. 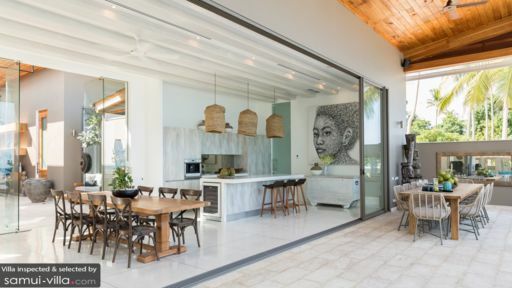 A BBQ is available for delicious alfresco dinners out on the veranda with a nice tropical drink to sip from while gazing at the sky turning pink, red and orange just before the stars come out. Villa Kirana features a nice and cool air-conditioned living room that opens up to the veranda and pool deck. The living room is designed with a traditional high-vaulted rooftop and lots of windows and doors to maximize the ocean view and creating a great sense of openness. The kitchen comes with a bar and stools for enjoying drinks together and there is a large dining table for spending quality family time with your loved ones. The lounge corner is fitted with a comfy sofa and a large flat-screen TV for entertainment. Everywhere in the room there is tribal artwork and beautiful paintings to be admired. A dedicated team of highly trained staff offers 24 hour service and security. The villa manager is happy to advise you about what to do and where to go, there is an excellent chef for in-villa dining and villa Kirana also offers a professional nanny to take care of the kids for an additional fee. 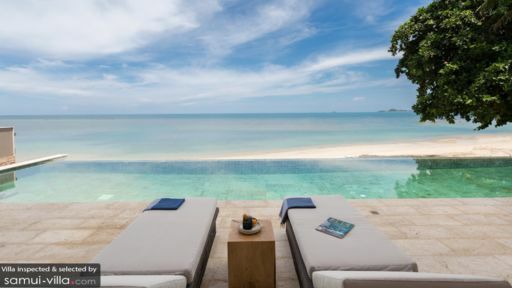 Villa Kirana is found in Bang Kao on the southern coast of Thailand's Ko Samui. Tropical sceneries, gorgeous white-sand beaches and azure blue waters are found all around the island, ideal for swimming, snorkeling and diving. For restaurants and café's you can visit Lamai, the islands second largest resort area with lots of shopping and dining venues. We stayed 6 nights at Villa Pavana and could have stayed another 6 weeks! The villa itself is amazing. modern and spacious. We chose not to venture too far as we all just wanted to relax and do nothing. Having the villa staffed really helped. Nice, Jang, Da and Nui made our holiday complete. We advise Nice each day our lunch and dinner requirements and Da, our wonderful chef produced fabulous meals. The kids all did a cooking class with her, with much laughter in the kitchen! This place is a little gem and we would return in a heartbeat. I have a good time here in Pavana Villa. A great house, great view, great service. Thank you again and we wish we can come back in the near future.